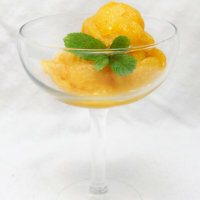 Home » Courses » Frozen Desserts » No Churn Mango Sorbet without Ice Cream Maker! No Churn Mango Sorbet without Ice Cream Maker! Staying cool over the summer is even easier. 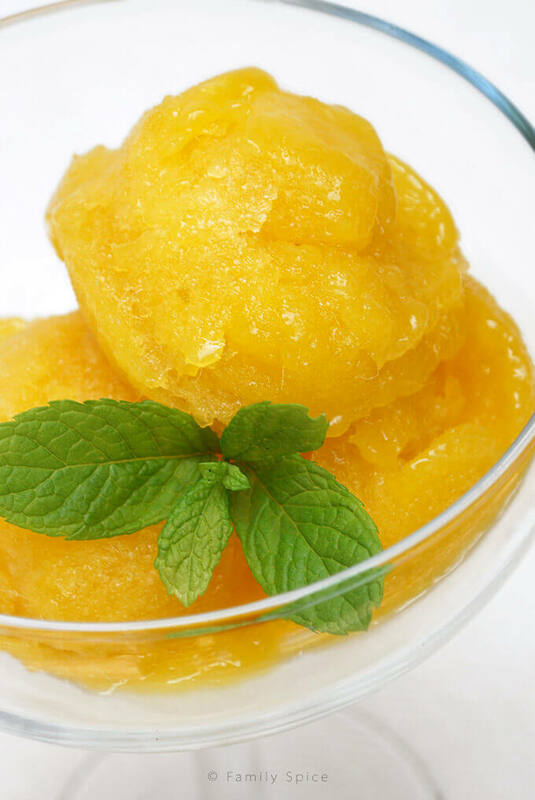 Anyone can make this no churn mango sorbet without ice cream maker. All summer long I have been reading these wonderful blog posts showing these gorgeous recipes for homemade ice cream and sorbets. I do not own an ice maker. I will also publicly admit that I am not a big fan of ice cream… unless it has chunks of brownies in it. When it comes to frozen treats, I prefer sorbets. There’s something refreshing about the taste of fresh fruits in their prime, whether fresh or frozen. Earlier this summer, my local grocer had a mango sale: 3/$1. I stocked up and decided that I would make Mango Sorbet without ice cream maker!! I am Wonder-Mom! How hard could it be? The messiest part was peeling and cutting up the mango chunks. That’s easy enough. 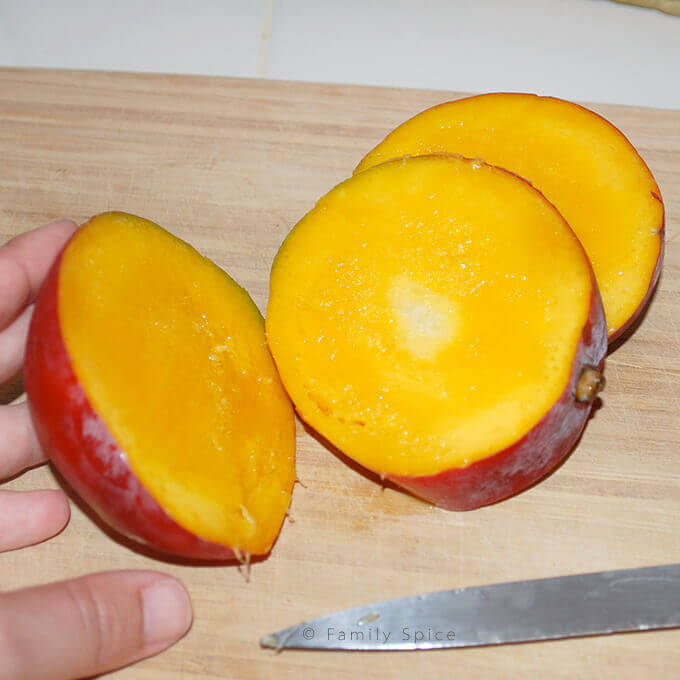 Simply cut the mango halves along the thin flat mango seed. Next, score each half with a knife in a checkerboard pattern. Turn each mango half inside-out and the mango segments pop up. You then just cut the segments off. 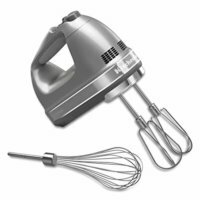 Most recipes had you make a simple syrup (equal parts water and sugar) before mixing everything in a blender. 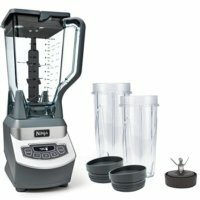 I like to simplify things, so I decided to mix everything together in the blender, skipping the extra step. Honestly, the sugar dissolves quickly when mixed on high for a couple minutes. No sugar chunks were found in this smooth sorbet. Ingredients were mangoes, sugar, water, lime juice and lime zest. You can reduce the amount of sugar based on the sweetness of your mango. I added a bit more lime juice to our mix because we like the zing lime adds. Now, as I said, I do not own an ice cream maker. So after you blend your mango mix until smooth, you pour everything into a freezer-safe bowl. A chilled metal bowl is preferred, although I used a plastic one. Pour your mango purée into the bowl, cover and put in the freezer. Here’s the tricky part. 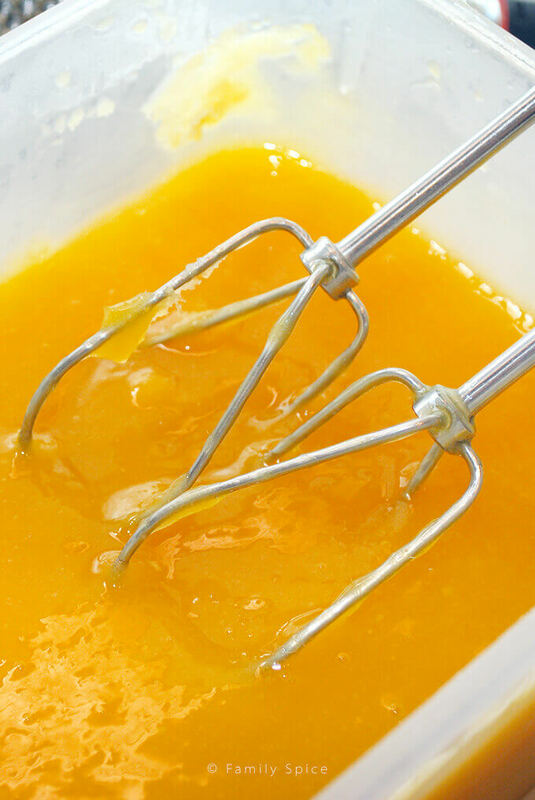 Every 30-45 minutes for 4 hours, remove your mango purée and re-mix everything together. This keeps the ice crystals from forming and saving your sorbet from turning into a giant mango ice cube. After 4 hours of freezing and re-mixing, let the sorbet freeze for 8 hours or until hard. This yields a little more than a quart of mango sorbet. My family loved the idea that Mommy made ice cream (no use being picking with the distinctions!) and the flavor was awesome. Although not owning an ice cream machine may have added extra work on my part, it was still very easy to make. And since my family loved it so much, I’m thinking an ice cream maker is definitely in our future! If you own one, let me know what you think of yours! 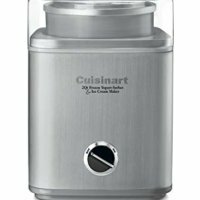 I’m thinking of this one by Cuisinart. Wash and pat dry mangos. 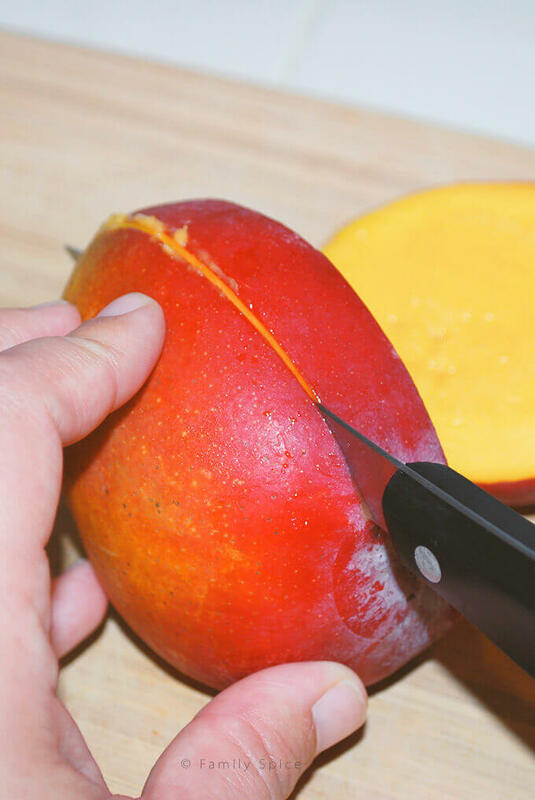 To cut, hold a mango with one hand, standing it on its end, stem side down. The mango has a flat oval pit inside. 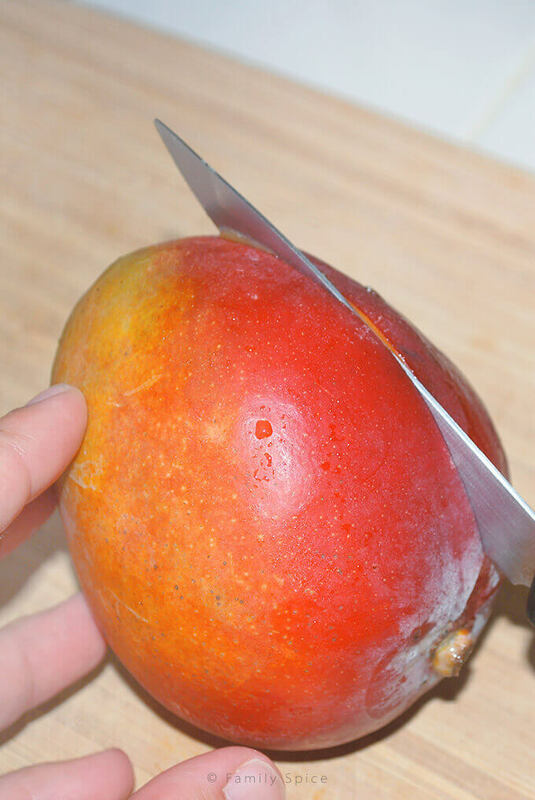 Using a sharp knife in your other hand, cut from the top of the mango, down one side of the pit. You will feel the knife slide along the pit, guiding you down. Turn the mango around and repeat with the other side. 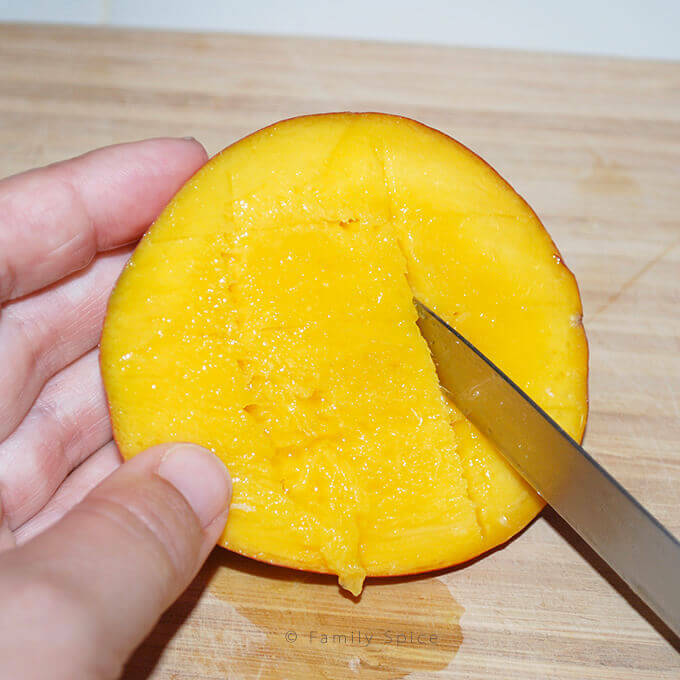 Take one mango half and use your knife to score the flesh of the mango both lengthwise and crosswise, making a checkerboard pattern of cuts into it. Do not to cut through the peel. Use a spoon to scoop out the mango segments from the peel. Or turn the mango half inside out so the mango segments pop out. Then use a knife to cut segments off the peel. Repeat with other mango half. 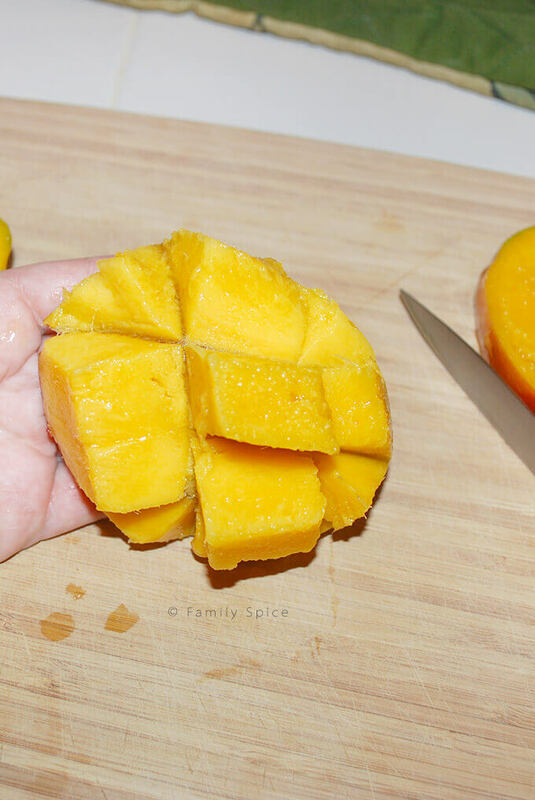 For the mango piece with the pit, lay it flat on the cutting board. Cut out the flesh from the pit, then remove the peel. Repeat this for the other mangoes. 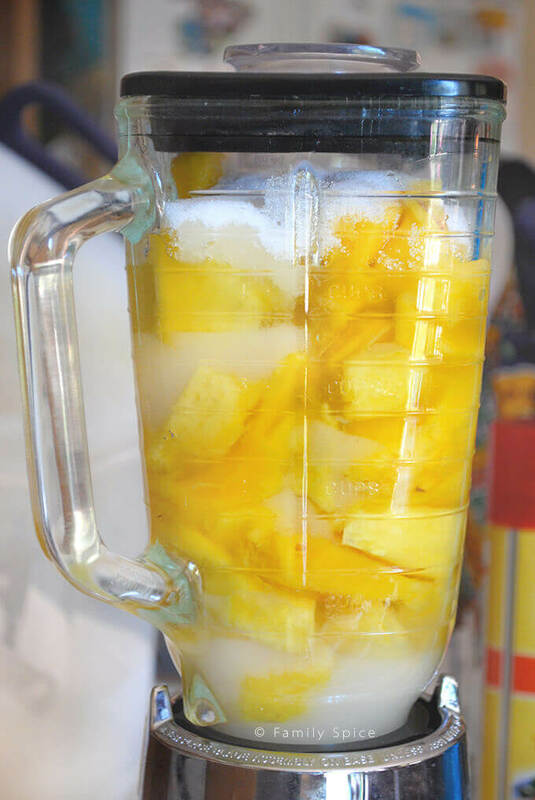 Add mango pieces to a blender and add remaining ingredients. Pour into ice cream maker and follow manufacturer's directions until done. If you do not have an ice cream maker, pour into a freezer-safe bowl and cover. 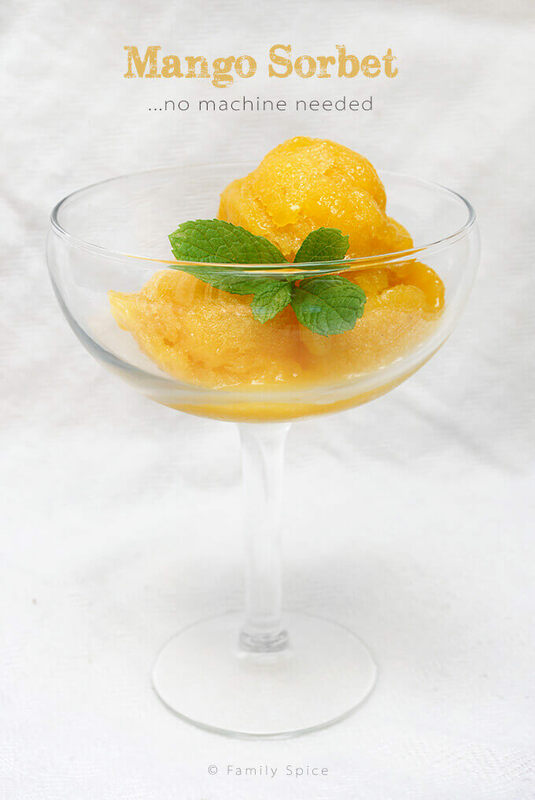 Every 30 minutes for 4 hours, stir sorbet very well with a whisk or a hand blender. Let sorbet freeze for 8 hours or until hard. Cooking Tips: You can reduce the sugar by 1/4 cup depending on the sweetness of the mangos. Did you ever get your ice cream maker? That is the one I have and I think it’s great! Go for it! Actually, yes, I now have an ice cream maker. It certainly is easier to make ice cream with a machine! I followed your recipe and as far as I know I followed the directions correctly. After I stirred the sorbet over the 4 hours, your recipe said to let it freeze for 12 more. I did freeze it but did not get back to it till quite a bit after the 12 hours to find that it is now one solid chunk of mango ice…what do I do now ? Will I have to chip off blocks of the sorbet and partially defrost it each time ? Sorry to hear about your chunk of mango ice! You can let it soften in the fridge for about 15 minutes before serving, or carefully soften it in the microwave (like using the defrost setting) for a few seconds at a time. I hope that helps! I have a small Cuisinart ice cream maker — with two bowls — and I love it! I keep one bowl in the freezer and the other stays in the maker. Like your recipe, though. Am planning to make some mango sorbet in bulk for a church retreat — and this way would be much easier than trying to do smaller batches in my ice cream maker. Although fresh mangoes are currently plentiful — and cheap — at my local supermarket, I may try to use frozen chunks, since I’ll be serving 100+ folks! Thanks for sharing! 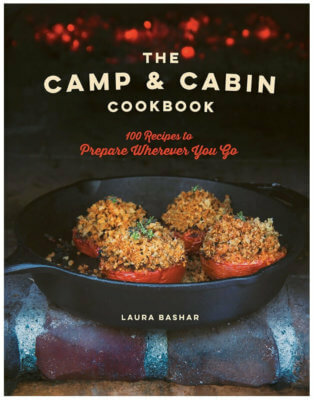 I made this recipe adding peaches from last year’s harvest. I actually made two batches. One using the lime as directed and one using lemon. Both are really yummy and refreshing. Next time I might blend in a little basil as well. I used my Cuisinart Ice Cream maker and all turned out great! I think I’ll be making alot more of this now that summer is here! Oh, peach sorbet sounds wonderful! And I love the idea of adding a bit of herbs to it. Great idea!